In Canada, the 16-month bidding process for Nova Scotia’s province-wide EHR project called OPOR (One Person One Record) comes down to the wire, with Meditech, Epic, Evident, and Harris Healthcare Group failing to make the final cut. Only Cerner and Allscripts were allowed to bid based on results from a qualification round that was apparently based entirely on their Request for Supplier Qualification submissions, a document of around 50 pages describing each company’s qualifications. Vendors were not allowed to provide detailed documents or to demonstrate their systems. Evident, a smaller vendor that was an original contender, has become vociferous in its allegations of what boils down to cronyism and an unfair procurement process. Even Epic, which wasn’t even approached by the government for a proposal, seems to have suffered from mysterious postal mishaps in not being made aware that Nova Scotia was considering its project until someone let them know in late 2016, then having its documents package delivered in time but not internally routed to the correct office by the deadline. Meditech, which is the incumbent vendor for many of Nova Scotia’s hospitals, did not make the short list despite no particular complaints from existing users. Vendors were told that the authority was not meeting with vendors, but Evident claims to have evidence that people involved with Cerner and Allscripts gained unfair access in social and educational settings, with Allscripts in particular having had executives participate in health authority’s “Let’s Talk Informatics” education events. A final decision is expected by the end of the year on the project, which could cost several hundred million dollars. From Spanker: “Re: HIMSS. Did you get this email?” HIMSS now claims that it is not only a “partner in the creation of transformative change,” but is also a leading “health and wellness association.” Any claims of health and wellness expertise or accomplishment by HIMSS or its members should be taken with a truckload of salt. It sounds good on a vision statement, but it’s insured sick people who make it rain for all of them. From Leading Indicator: “Re: IT advice. Links here.” LI calls out three recent examples in which people who have never worked in a health system IT department – much less run one – apparently feel qualified to tell CIOs how to manage their IT organizations, dispensing painfully obvious, simplistic recommendations that usually involve soft subjects like management style or consumerism. I’m all for pontification based on experience and accomplishments (and have seen plenty of it), but possessing a TV, armchair, and beer does not make one a coach. Medicare quality reporting company Mingle Analytics merges with care management software company SilverVue to form Mingle Health. Optum360, Waystar, and TruBridge take top spots for customer satisfaction and client experience across multiple categories in Black Book’s latest RCM technology and outsourcing solutions survey. 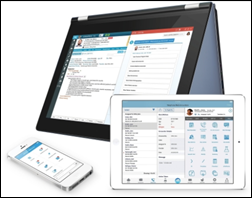 EClinicalWorks adds an opioid risk smart form to its EHR, giving providers the ability to assess a patient’s risk for drug abuse and offer alternatives that align with CDC recommendations. Philips releases IntelliVue Guardian, an mobile app that allows clinicians to view patient vital signs and early warning scores on their Android mobile devices. Medication safety technology vendor Tabula Rasa HealthCare creates a technology and consulting division called CareVention HealthCare. Peter Pronovost, MD, PhD joins University Hospitals (OH) as chief clinical transformation officer, where he will oversee population health, high-reliability medicine, the ACO, and digital health initiatives. Thanks to the reader who forwarded the internal announcement. Pronovost left Hopkins Medicine after seven years in February 2018 to join UnitedHealthcare as SVP of clinical strategy, was promoted to chief medical officer in June 2018, then resigned three months later. Healthwise appoints CMO Adam Husney, MD to the additional role of CEO. Health Catalyst brings on Ryan Smith (Banner Health) as SVP of client engagement; Will Caldwell, MD (Novant Health) as SVP of physician and market development; and Cathy Menkiena, RN (Encore Health Resources) and Steven Vance (Intermountain Healthcare) as VPs of professional services. ClearData promotes Chad Coder to VP of strategic alliances. Managed care organization Virginia Premier selects ZeOmega’s Jiva population health management software. Amazon announces that Alexa is now able to answer questions about opioids and the opioid epidemic shortly after President Trump signed the opioids-focused SUPPORT for Patients and Communities Act into law. The company’s AWS Opioid Crisis Council has also pledged to use the cloud to improve first responder access to medical records, and identify fraud using PDMP data and analytics. A two-year OCHIN study on the feasibility of documenting social determinants of health in EHRs finds that end users need more training to ensure relevant data is entered and acted upon, especially in the area of referrals for community services. Screenings for community service referrals ended up creating unmanageable workloads. Weird News Andy’s clickbait headline for this story is, “Physician, Steal Thyself.” A 79-year-old doctor borrows $300,000 from a patient to keep her struggling practice afloat, then when asked to repay the money, diagnoses the patient with dementia without any supporting evidence. The doctor says the accusation is “all lies” and that she’s been making loan payments since she borrowed the money 20 years ago, but she nonetheless voluntarily surrendered her medical license in assuming that her case is unwinnable. The Imprivata Cares team participates in the Technology Underwriting Greater Good’s annual Tech Gives Back event by hosting a Shark Tank-style event for local middle schoolers and volunteering at a homeless shelter for young adults. InterSystems will exhibit at the CHIME Fall CIO Forum October 30-November 2 in San Diego. ScriptPro will offer OmniSys’s Fusion-Rx interactive voice response system for prescription refills with its pharmacy management solutions. Meditech posts a video describing how Med Center Health uses quality metrics to reduce sepsis mortality and readmission rates. Formativ Health adds XpertDox data to its patient engagement technology, giving providers the ability to match up patients with best-fit providers and clinical trials. Strata Decision Technology recaps its Lift18 user conference, which drew 650 attendees and offered Paul DePodesta from the movie “Moneyball” (played by Jonah Hill) as a keynote presenter. The company announced Time-Driven Costing that allows health systems to understand operational costs beyond traditional cost accounting. As a long-time admirer of Dr. Pronovost’s patient safety efforts, I appreciate his good judgment, timing and protection of his reputation in quick exit from UH CMO role. UH clearly is an industry behemoth. But our experience years ago was they were “ill-informed” even after acquiring many CISs, e.g. PICIS, about differences between claims and clinical data and challenges and costs of clinical data definition, integration and interoperability. We had an intense educational conference calls with execs laying out issues and requirements, with realistic options – no “consultant hype” to win business and deal with reality later. We were never hired but learned then CIO (smartly) moved on shortly thereafter. Hopefully their IT savvy came a long way since then given their market reach.